Today more than ever, talent moves across borders to countries which provide the best opportunities. Attracting and retaining talent to support development thus is of national strategic importance. 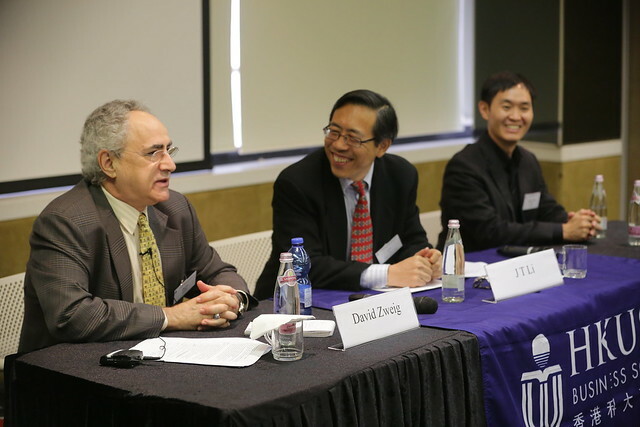 Prof. David Zweig, Chair Professor of Social Science, and Prof. Joon Nak Choi, Assistant Professor of Management, shared their insights on efforts by China and South Korea to attract international talent in the Business Insights Presentation Series co-organised by HKUST Business School and IEMS on 10 April 2014. Prof. Zweig explained that in his research based on interviews with mainland Chinese entrepreneurs, including both locals and returnees, he found that among entrepreneurs and scientists, technology is the primary catalyst generating reverse migration as returnees are significantly rewarded by taking existing technologies from their host countries to China. These technologies are not necessarily “cutting-edge” globally, but as long as the technology is new for China, returnees can displace older domestic technologies and win greater domestic market shares. In fact, 62% of those returning for reasons related to technology admit that their technology was new to China but had existed outside China long before. In his talk based on part of a forthcoming coauthored book on Global Talent- Skilled Labor as Social Capital in Korea to be published by Stanford University Press, Prof. Choi noted that Korean firms have largely failed in recruiting skilled foreign workers primarily because of Korea’s uninviting mono-ethnic culture. He proposed a new approach to enticing Korea’s pool of skilled émigrés back to Korea, namely by nurturing social ties. He argues that international social ties benefit economic development by promoting information flow, providing access to new markets, and by monitoring global trends. Thus, establishing closer ties with overseas Koreans can help ameliorate the talent shortage. To attract rooted businessmen who usually plan to return to South Korea, the work culture of Korean companies should be reformed so that career prospects remain attractive. The country should also build social capital with estranged businessmen who are more interested in short-term return to reclaim cultural identities or to pursue career opportunities. Both studies suggest that policy-makers have a strong role to play in developing favorable policies to attract high- end returnees, and provide valuable insights into factors to consider in designing such policies.